One of the UK’s leading classic vehicle insurance brokers, Footman James, is offering enthusiasts the chance to join them on a Drive-It Day like no other. On Sunday 22nd April 2018, Footman James will be joined by partners, Chateau Impney Hill Climb and Classic Motor Hub for a classic day out across their two fantastic locations. Drive-It Day takes place every year to help raise awareness of the classic vehicle movement in the UK and encourages classic vehicle owners to show off their classics as much as possible. Organised by the Federation of British Historic Vehicle Clubs (FBHVC), Drive-it-day celebrates the UK’s rich transport heritage. 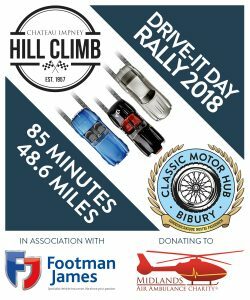 Footman James, alongside their partners, Chateau Impney Hill Climb and the Classic Motor Hub are therefore taking this opportunity to help organise a fun Drive-It Day. The day will start at 9:00am where enthusiasts will gather at the stunning grounds of the Chateau Impney estate; home of the Chateau Impney Hill Climb which returns this July. Enthusiasts will be able to come together for a bacon butty and a hot drink before setting out at 10:30 on their drive. The route will pass through the beautiful countryside lanes of the Cotswolds; stopping at the Classic Motor Hub in Bibury. Arriving at the Classic Motor Hub between 12:00-12:30, enthusiasts will get chance to unwind and tuck into locally sourced food from Eat Wild and soft drinks whilst discussing everything classic vehicle related. Not only this, it is a perfect time to see where the hub hosts their monthly coffee and classic morning events which takes place on the first Sunday of every month. Please keep an eye on The Classic Motor Hub Facebook page for the most up-to-date information. Classic Motor Hub’s Martin Chisolm stated, ‘The Classic Motor Hub is more than just a showroom, with a superb event planned for Drive-It Day 2018. We’re very pleased to be working in conjunction with both Chateau Impney and Footman James to offer a fantastic cross-country rally route from the Chateau to The Hub’. Tickets cost just £15, but hurry as there is limited space! The ticket price includes; a bacon sandwich and drinks at Chateau Impney, plus a burger and a drink at the Classic Motor Hub. Not only this, within the price is a £5 donation to The Midlands Air Ambulance charity; a charity that funds and operates three air ambulances serving the communities of six Midland counties including: Gloucestershire, Herefordshire, Shropshire, Staffordshire, Worcestershire and the West Midlands. Tickets are now on sale and can be purchased over on the Classic Motor Hub’s shop page, under events on their website; but act quick as the tickets are given out on a first come, first served basis. David Bond, Managing Director at Footman James commented, ‘Drive-It-Day is a day where like-minded individuals come together to celebrate an industry that we love. We are all proud to be supporting The Midlands Air Ambulance as we know the hard work they put in throughout the year. We are thankful to our friends at Chateau Impney Hill Climb and Classic Motor Hub who are working with us to make our Drive-It-Day extra special for enthusiasts. We hope that the day brings people together and helps inspire others to consider joining a community that is so special to us. For further information about Footman James please contact 0333 207 6000 or visit www.footmanjames.co.uk. Footman James has enjoyed a unique relationship with vintage and classic vehicle enthusiasts and clubs; offering policies with benefits that are important to the enthusiast. Its policy choices include classic car and classic motorcycle as well as home insurance. Classic owners can also insure their modern private car or modern motorcycle. Footman James is part of Towergate, the UK’s largest independent owned insurance intermediary. Footman James is a trading name of Towergate Underwriting Group Limited. Registered in England No.4043759. Registered Address: Towergate House, Eclipse Park, Sittingbourne Road, Maidstone, Kent ME14 3EN. Authorised and regulated by the Financial Conduct Authority. Telephone calls may be monitored or recorded for your protection.